Arrive Bangkok transfer to your hotel. Take and evening cruise on the Chao Phraya River with a Thai Style Buffet and a Cultural show. The following day we visit the Royal Palace, the Wats, enjoy the many markets and take a boat ride along the Chao Phraya River evening free for your own leisure. The Bridge over the River Kwai, is 240 km from Bangkok and offers a mix of nature, history and adventure. A world away from the hectic pace of the capital, its a province of startling natural beauty with a rugged landscape of waterfalls, caves, leafy forests and limestone cliffs. 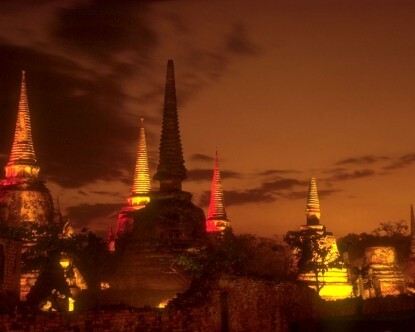 Visit the Hellfire Pass Memorial Museum before driving to Ayutthaya which was the capital of Thailand between 1350 / 1767. The city fell to the Burmese in 1767 and many of its religious sculptures and temples were destroyed, several still remain however and many have been restored. After dinner, board the 1st class overnight sleeper train to Chang Mai. On arrival into Chang Mai check into your hotel and enjoy the morning relaxing. After lunch visit the stunning Doi Suthep temple on the mountain top. Here you can see stunning views of Chang Mai below. Return to the hotel and the evening is free to roam the city and its bustling night markets. Drive from Chang Mai for about two hours towards Chiang Dao where we visit the Chiang Dao Caves before having lunch. Continue for about another hour to an Akha village where we start a three hour moderate trek before arriving and spending the night in a Palong Village. Accommodation will be in a Homestay in a hilltribe house. After breakfast ride out of the village on elephants for about an hour before continuing on foot for half an hour till reaching the road where transport will take you to the river where we have a picnic lunch. 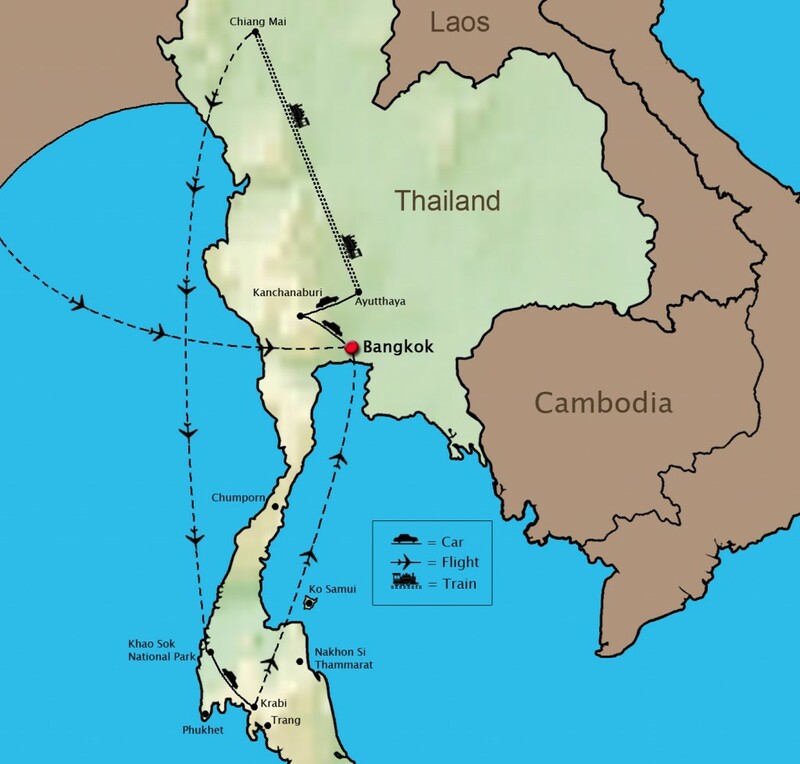 Take the morning flight from Chang Mai to Surat Thani with a connection in Bangkok and onward to Khao Sok National Park. After breakfast, we head to our Elephant camp to discover the wonders of these creatures which are revered in Thai culture. Here you have two choices, either to stay at the camp, either to help the handlers with feeding and bathing the elephants,this will be a hands on activity, or take a fantastic Elephant Trek with a professional mahout through the jungle (Please specify at the time of booking) . Lunch will be taken at the camp followed by canoeing along the Sok river, before return to our hotel. Wake up to the sounds of the birds and the smells of nature, enjoy your morning breakfast before taking a trek through the jungle to discover nature at first hand with our experienced guides. They will inform you of all the flora and fauna and creatures which live and thrive here in abundance, weather permitting, our lunch will be served in the traditional cooked way of using bamboo, before heading back to our hotel to check out to leave for Krabi On arrival check in to your chosen hotel for four nights complete relaxation. Relax on the beautifully sandy beaches of Krabi, explore the nearby Islands, visit James Bond Island or Koh Phi Phi, or head inland and explore Krabi Town and the Inland jungle, these are just some of the things you can consider whilst staying here. Transfer to the airport for your flight to Bangkok, transfer and check in on arrival, spend the rest of the day on some last minute shopping for gifts, or arrange a dinner cruise for your last evening in Thailand.